Many business professional rely on the “tasks” or “to-do” functions found in popular desktop software such as Microsoft Outlook to help keep themselves organized. Tasks are useful for prioritizing your day, or just keeping track of the things you don’t want to forget. Anyone who has read David Allen’s Getting Things Done will tell you that the key to time management is to organize your priorities on an external to-do list. This way, the brain has can better focus on the task at hand than on keeping track of all your tasks. CompanionLink’s software for Android phones allows you to carry your tasks with you, ready to access at a moments notice. 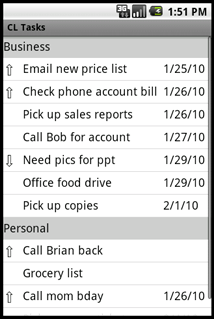 Users are able to sync tasks/to-dos from Outlook, Lotus Notes, ACT! by Sage, Novell GroupWise, Goldmine and Palm Desktop to an Android phone via a secure USB connection. CompanionLink works through the CL USB Sync app users download to their Android phone. This app has advanced Tasks functionality to group and sort by category, date or alphabetically. Power users who use categories to manage their Tasks on the desktop will be pleased to find that these categories sync across to the phone. With the powerful built-in search feature, managing hundreds of tasks is a breeze. For more information and to download a free trial, visit www.companionlink.com. This entry was posted in CompanionLink Products and tagged android, android sync, android tasks, android usb sync, getting things done, tasks by Andy Sheragy. Bookmark the permalink.